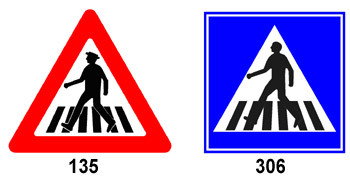 What is the difference between the following traffic signs? Traffic sign 306 alerts about a pedestrian crossing ahead, while traffic sign 135 marks the place of the crossing. 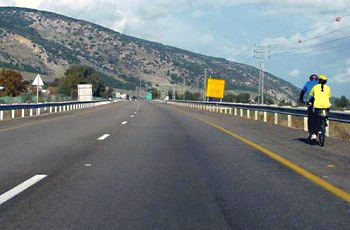 Traffic sign 135 is placed in non-urban roads, while traffic sign 306 is placed in freeways. Traffic sign 135 alerts about a pedestrian crossing ahead, while traffic sign 306 marks the place of the crossing. These restrictions concern the motorcycle’s standard and not the manner of riding it. The driver must obey these restrictions. The restriction is just a recommendation which doesn’t obligate the driver. The driver shall decide at his own discretion which restrictions should be taken into consideration. What risk do riders of two-wheelers face while passing between two rows of cars that stand before an intersection? There is no risk, as there is always enough space for two-wheelers to pass comfortably and safely. 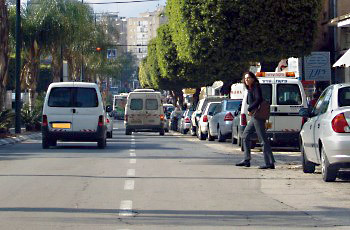 The risk is that at the beginning of the row, next to the intersection, there is no more space left because there are many two-wheelers standing there. They might hit pedestrians who are not using a regulated pedestrian crossing. They might be hit by cigarette butts thrown by vehicle drivers. Drive in the middle of the road and turn-on the winker before each turn. Drive faster in order to pass the place. 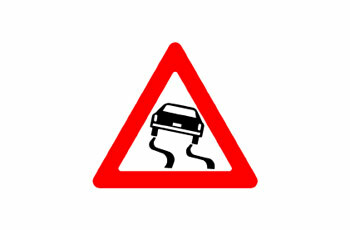 Slow down and move to the road’s left in the left curve. 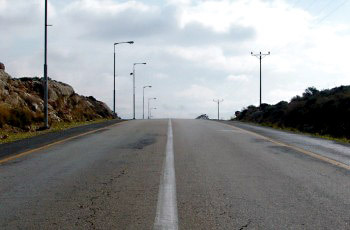 Slow down, adjust your speed to the road’s conditions and keep to the right of the road. Does not depend on driving speed. Depends on road conditions only, and not on the vehicle or the driver. Improves the faster you drive. Increases when driving at a suitable speed for the varying road conditions. Who is legally responsible for the registration of a change of ownership? The registered vehicle owner and the buyer of the vehicle. The buyer of the vehicle only. The owner of the vehicle testing facility. A path for bicycles only. Driver pay attention, bicycles passing. Designated lane for motorcycles and bicycles only. Is it obligatory to obey the directions and signals of a military policeman, even when a certain direction or signal is opposed to the traffic signs? Yes, it is obligatory to obey with full caution. Yes, except for directions which contradict a no-entry sign. Yes, except for directions which contradict a stop sign. 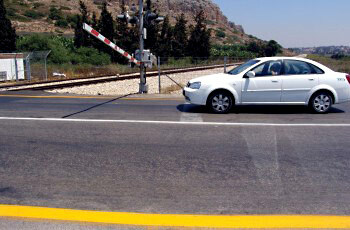 Is it permitted to drive through a railway crossing when the barrier is moving downwards or upwards? It is permitted to drive through, as long as you drive carefully. It is allowed for as long as the barrier doesn’t reach its bottom position and locks. It is allowed when the barrier starts to rise. No.It is prohibited for as long as the barrier is in movement to any direction or when it is horizontally positioned. What impossible situation is depicted in the following picture? How are you required to conduct yourself in the following road section? 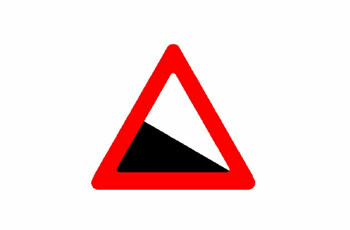 Drive in low gear, steep climb ahead. Drive in high gear, to prevent engine overheating. Slow down, drive in low gear and maintain the engine’s temperature. Slow down and keep to the right of the roadway, due to the limited field of vision. Slow down and follow the accepted right-of-way rules and the traffic signs that are placed at the intersection. Cross the intersection quickly, while paying attention to vehicles approaching the intersection from your right. Slow down and give right-of-way to vehicles coming from your right only. Always stop before the intersection and cross it when it is free of traffic only. When are we not obligated to drive in the right lane? When another vehicle overtakes us from the left on a two-lane roadway. When we pass another vehicle from its right side. When another vehicle in front of us signals about its intention to start driving on the roadway’s left side. Stopping is prohibited on both sides of the vehicle. Stopping is prohibited on the right side of the roadway and on the hard shoulder. Stopping is prohibited on the roadway only. Stopping is prohibited on the hard shoulder only. Who are obliged to act cautiously? 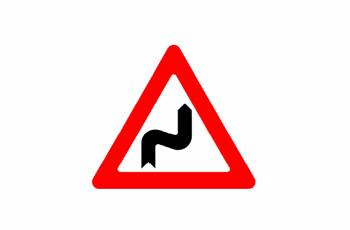 Left curve followed by a right curve. Drive in the center of the road. Anywhere, neither in urban roads nor in inter-urban roads. In any type of road, except in urban two-lane roads. When a “pedestrian crossing” blue sign is at place. 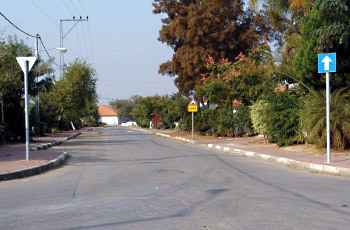 Only when a “pedestrian crossing ahead” road sign is placed. How would you avoid hitting the pedestrian in the picture? Warn him by honking loudly and continuously. In the given situation there is no way to avoid hitting the pedestrian. Brake strongly and honk early to drive the pedestrian away to the sidewalk. Drive slowly and identify the pedestrian as early as possible on the road. Is a motorcycle permitted to tow other vehicles? No, a motor vehicle with 3 wheels or less is prohibited to tow. Yes, when the towed vehicle is a two-wheeler. You are permitted to cross the lines. However, vehicle traffic from the opposite direction is not permitted to cross them. You are permitted to cross the lines. However, vehicle traffic from the opposite direction has right of way. You are permitted to cross the lines because the driver has right of way. You are forbidden to cross the lines. However, a vehicle from the opposite direction is permitted to cross them when the road is clear. What is the distance we are required to keep from the vehicle in front of us while driving? Any distance that allows us to see the back wheels of the vehicle in front of us while driving. Any distance that always allows us to see well what’s happening ahead of the vehicle that is driving in front of us. The required statutory distance in which accident may always be prevented, while taking all the relevant elements into consideration. A distance which prevents entry of other vehicles in it. How would you conduct yourself according to the following picture? Cyclists are of no danger to vehicles. Drive normally when they are nearby. The cyclist is not stable and is affected by the fast vehicles passing by. Slow down when approaching him. When passing by cyclists, drive faster to reduce the period of conflict with them. When passing by cyclists, honk a few times to have their attention. The braking distance is always greater than the stopping distance. The braking distance always equals the response distance. The stopping distance is always greater than the braking distance. What is the correct way for changing lanes? Lane change should be done in two stages: First deviating and then signaling with the hand. 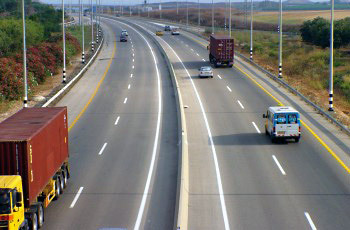 Lane change should be done in two stages: First deviating and then communicating with the other drivers. You should pass to the other lane through the shortest diagonal distance and as quickly as possible. First perform a check and glance at the mirrors, then check the lane you want to pass to, verify that you can pass to it and then deviate moderately (diagonally) to the other lane.